At 3,200 feet elevation, Camp Verde enjoys a mild climate, not excessively hot in summer and unaffected by heavy snowfall in the winter. The town sits on a small hill beside a bend in the Verde River, bordered by the Black Hills to the west and a wooded mesa to the east, part of Coconino National Forest. Facilities in the center include a shopping center (with Basha's supermarket), RV site, NPS office and a fair selection of restaurants, while most hotels are found a short distance north, at the Hwy 260 exit of interstate 10. From here, Flagstaff is 60 miles north and Phoenix 90 miles south. 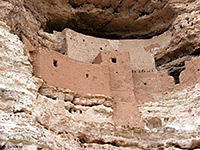 Fort Verde State Historic Park, also in the center, preserves a collection of late 19th century buildings, but the main attraction in the area is Montezuma Castle National Monument, beside the river 5 miles north. This popular park contains a spectacular example of a Sinagua cliff dwelling, with 5 stories, built high up in an inaccessible alcove. Other sites of interest in the vicinity are Dead Horse Ranch State Park (17 miles), Sedona (28 miles) and Tuzigoot National Monument (20 miles). The Comfort Inn Camp Verde hotel (Verde Valley) is situated right next to interstate 17, just south of exit 287 (US 260), close to a few gas stations and restaurants. The immediate surroundings of the hotel are undeveloped desert, but the center of Camp Verde is 2 miles to the southeast and the nearest major attraction is Montezuma Castle National Monument, 5 miles north. The Comfort Inn has an outdoor heated pool, hot tub, business center and guest laundry, while complimentary amenities include continental breakfast (with hot waffles), a weekday newspaper and wi-fi. An outdoor pool, whirlpool, free wi-fi and deluxe free continental breakfast are the main amenities of Days Inn Camp Verde, an affordable, interior corridor hotel on the east side of I-17 exit 289, right next to one restaurant (Denny's) and close to several others. Some of the 63 rooms are equipped with a microwave & refrigerator; all have a coffee maker, hairdryer, cable TV and ironing facilities.